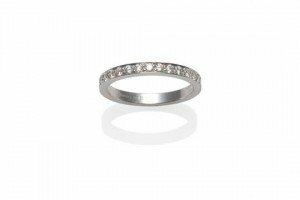 A Platinum Diamond Half Hoop Ring, round brilliant cut diamonds in white claw settings, to a plain polished shank, total estimated diamond weight 0.30 carat. 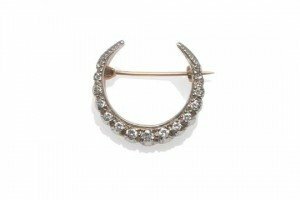 A Diamond Crescent Brooch, set with graduated round brilliant cut and eight-cut diamonds, in white claw settings, on a yellow mount, total estimated diamond weight 0.35 carat approximately. 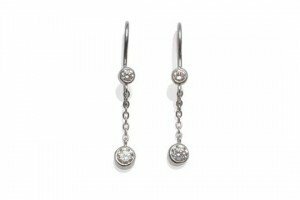 A Pair of Diamond Drop Earrings, a collet set round brilliant cut diamond suspends a chain length to a second diamond, total estimated diamond weight 0.55 carat approximately, with hook fittings for pierced ears, drop length 3.5cm. 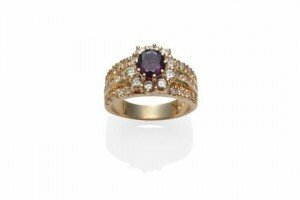 A Ruby and Diamond Cluster Ring, the oval mixed cut purple-red ruby within a border of round brilliant cut diamonds, to three rows of further diamonds on each shoulder, in yellow claw and channel settings. 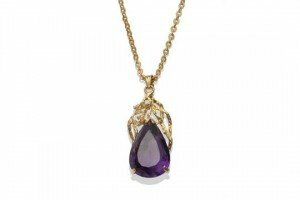 An Amethyst Pendant on Chain, a pear cut amethyst in a yellow three claw setting with a textured branch effect mount, on a textured link chain. 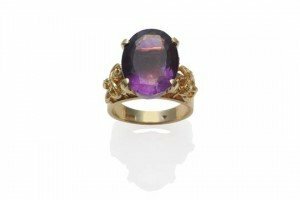 An Amethyst Ring, an oval mixed cut amethyst in a yellow claw setting, to textured scrolling shoulders on a plain polished shank. 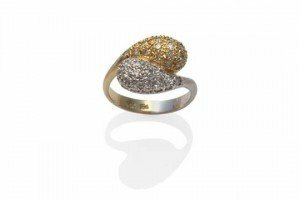 A Diamond Cross-over Ring, one white section and one yellow, each pavé set with round brilliant cut diamonds, to a two colour plain polished shank. 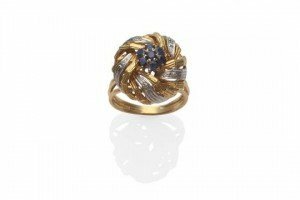 A Sapphire and Diamond Set Floral Cluster Ring, a cluster of sapphires in yellow claw settings, within textured white and yellow radial sections, on a three row shank. 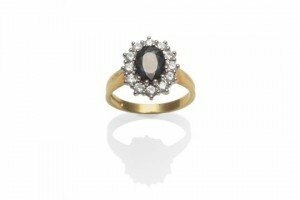 An 18 Carat Gold Sapphire and Diamond Cluster Ring, an oval cut sapphire within a border of round brilliant cut diamonds, in white claw settings on a yellow tapered shoulder plain polished shank, total estimated diamond weight 0.40 carat. 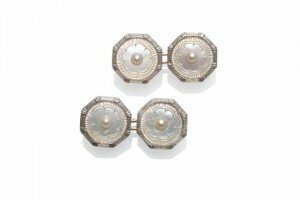 A Pair of Mother-of-Pearl Cufflinks, each head comprises a split pearl to the centre of an engraved mother-of-pearl panel, within a white frame, bar linked. 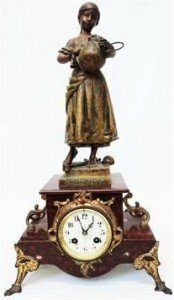 A 19th Century French red marble cased and gilt spelter ornate mantel clock surmounted by a painted spelter figure of Cinderella. 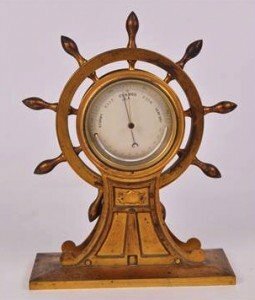 An early 20th century gilt metal barometer in the form of a ship’s wheel, the circular gauge housing a semi-circular mercury thermometer, the wheel set on outswept stand and rectangular plinth. 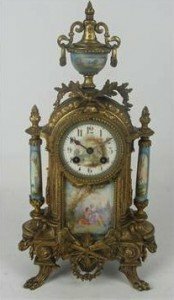 A 19th century French gilt metal porcelain mounted eight day mantel clock, the urn surmount above circular dial painted with Arabic numerals flanked by porcelain pilasters above a similar plaque decorated with a couple in a landscape, in a stepped framed with paw feet. 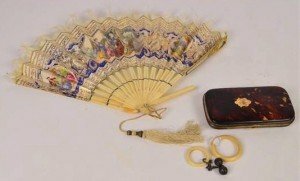 A late 19th century small tortoiseshell clutch purse, the exterior set with an initialled cartouche, the purple silk interior with pockets, and a boxed vintage paper fan with bone sticks and feather fringe, with tassel handle and a plain circular ivory baby’s teether and a smaller bone example with hallmarked silver chain and bells. 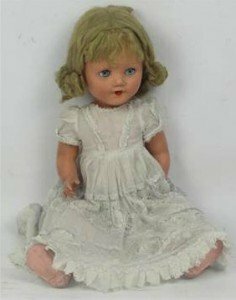 A mid 20th century composite headed doll with open mouth revealing four teeth, open/close eyes, with blonde hair, stamped with makers mark FP23 both to the neck and back of the body, wearing a lace dress, length 63cm. 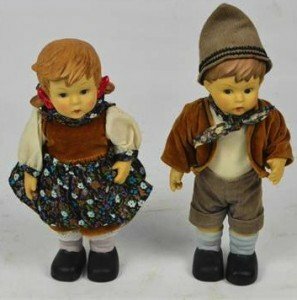 A pair of boy and girl bisque dolls dressed in Austrian clothing with integral shoes and socks, with mark to back of head of an arrow within a circle below three stars, height of each 25.5cm. A collection of nine assorted French finger dishes and comport dished, enamelled with gilt scroll foliate detail. 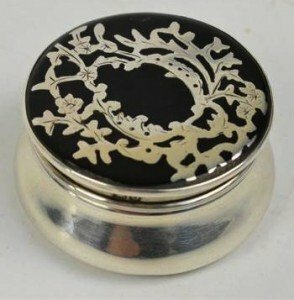 A George V hallmarked silver circular pill box with tortoiseshell pique-ware decorated detachable lid enclosing gilt interior, Lawrence Emanuel, Birmingham 1913. 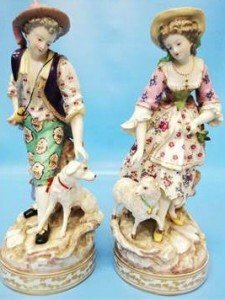 A pair of 12″ antique continental figures, a young man with a dog and young lady with a lamb, base marked with gilt crown over entwined CF. 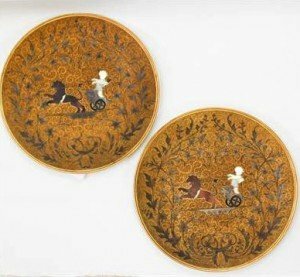 A pair of Italian possibly Rome plaques late Nineteenth/early Twentieth Century, gilt metal inlaid with hardstone, mother of pearl, cherubs, lions, chariots and foliate detailing.